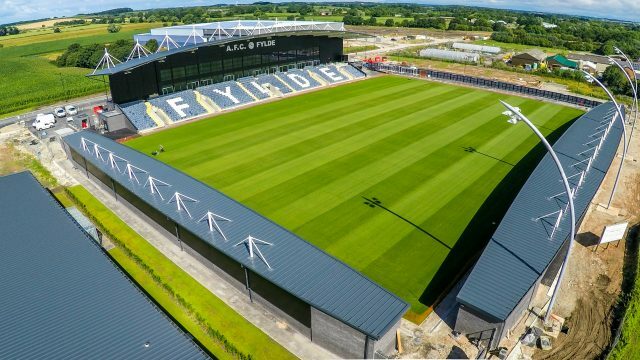 Mill Farm is a multi-million pound Sports Village and new home to rising football team AFC Fylde. Situated a stone’s throw from Junction 3 of the M55, the development houses a state-of-the-art 6,000-seater stadium and several 3G football and hockey pitches. The stadium includes a cutting-edge sports bar which is fast becoming the UK’s number one sports bar. Bradleys Sports Bar features over 20, 60 inch TVs and an impressive 12′ x 7′ video wall across five distinct areas so every type of sport can be followed by fans simultaneously, an 80-seat restaurant with roof terrace, a 40 seat café and conference & event facilities across nine rooms. Also on site is an Aldi supermarket, Euro Garages petrol station with a Sainsbury’s Local, Greggs bakery and KFC fast food restaurant. This complex is at the heart of the community and we’re really looking forward to welcoming everyone; from brides & grooms, to sports fans, community groups and business people. Mill Farm also has 3G pitches for both football and hockey. Mill Farm is also home to Fylde Hockey Club, who are sponsored by Greenfields. Access to the site via the A585 is less than 1 mile from the M55 Junction 3 to the north, which leads to Blackpool to the west and Preston and the M6 to the east. To the south, the A585 Fleetwood Road forms the Kirkham and Wesham Bypass and connects with the A583 Blackpool Road, a main route between Blackpool and Preston. Get directions via Google Maps. The closest bus stop to the ground is approximately a 5 minute walk from the centre of the site. Kirkham and Wesham Railway Station is approximately half a mile away; a comfortable walking distance. The station is operated by Northern Rail with approximately six services per hour in each direction. The No. 61 bus service offers a service every 30 minutes and connectivity through Blackpool – Preston – Kirkham.